Long before JFK’s white-frame clapboard summer White House along Nantucket Sound in Hyannis Port, there was Sagamore Hill, Theodore Roosevelt’s beloved home on Long Island, in Oyster Bay, New York. The sprawling two-story brick and frame mansion was Roosevelt’s retreat, summer White House, and home to his family from 1885 until his death in 1919. 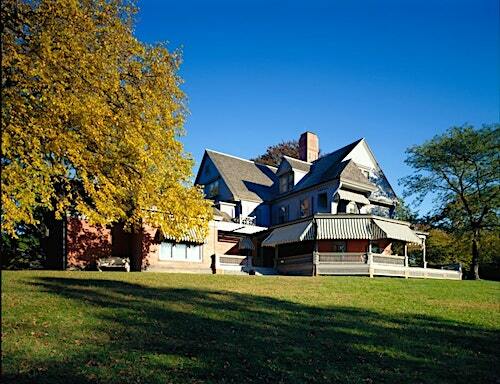 Sagamore Hill was also the only home Roosevelt ever owned. This photo shows the a view of Sagamore Hill and the sloping path leading up to the house from the southeast (Library of Congress, Prints & Photographs Division, HABS, Reproduction number HABS NY,30-OYSTB,2- Public Domain). In Sagamore Hill, built in 1885, two main architectural styles with a lot of similar features have been fused to produce a wonderfully livable and friendly home. Reminiscent of seaside resort homes, Sagamore Hill features the horizontal lines and abundance of windows of the Shingle-style architectural design. Typical of the Shingle style home plans on the East Coast, Sagamore Hill is spacious and, with its 23 rooms, ideal for a large family and for entertaining guests. And like today’s Victorian (Queen Anne) style house plans, it has an asymmetrical facade, roof lines, gables, and turrets. This northwest view of Sagamore Hill shows the large, partially covered side porch. The entrance to the home is on the south side of the house (photo source: Public Domain). 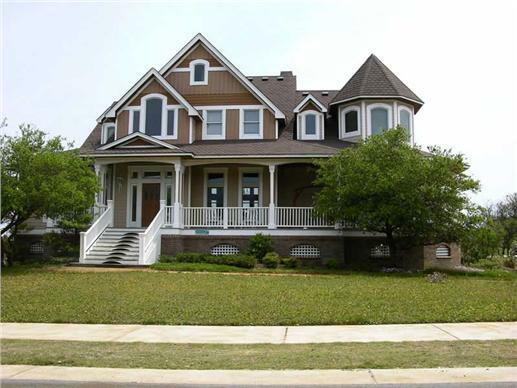 Today’s Victorian style home: A contemporary two-story five-bedroom home features the signature asymmetrical roof lines, gables, and covered wraparound porch (Plan #130-1054). The informal and relaxed feel of the Shingle style: This two-story, six-bedroom home features the typical horizontal lines, windows, and pillars supporting the covered wraparound porch (Plan #161-1044). In 1905, Roosevelt added the famous North, or Trophy, Room – where he displayed his books, paintings, sculptures, artifacts from international dignitaries, and taxidermy pieces from his hunting days. 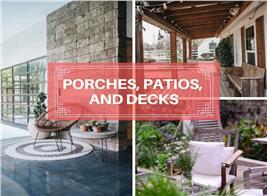 The hand-crafted stone and woodwork and use of natural materials, like wood, especially in Roosevelt’s addition, borrows from the Craftsman and Arts and Crafts house plan styles. 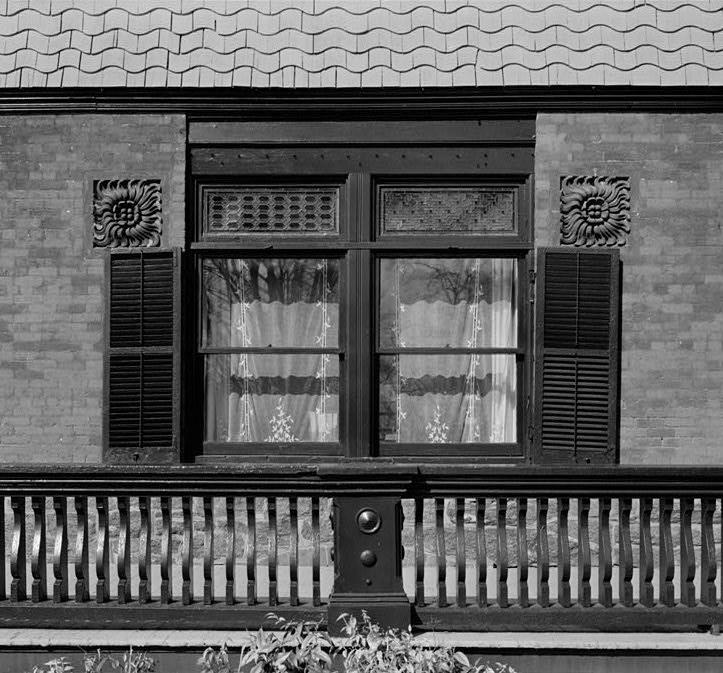 Details of Sagamore Hill’s central gable are in full view in the top photo (Library of Congress, Prints & Photographs Division, HABS, Reproduction number HABS NY,30-OYSTB,2- Public Domain). 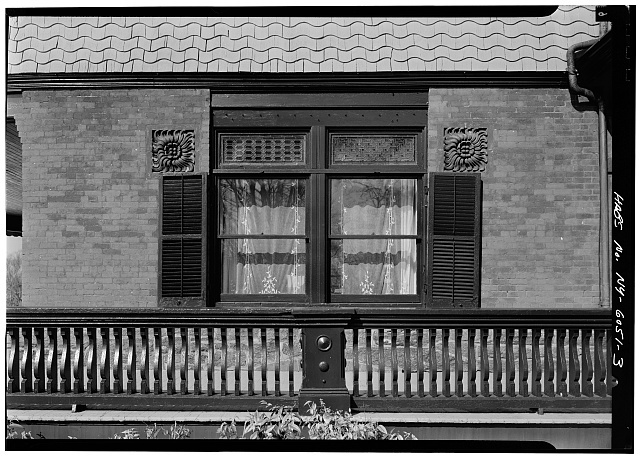 Craftsman and Arts and Crafts influences are evident in the intricate wood and stonework on the window at bottom (Library of Congress, Prints & Photographs Division, HABS, Reproduction number HABS NY,30-OYSTB,2- Public Domain). 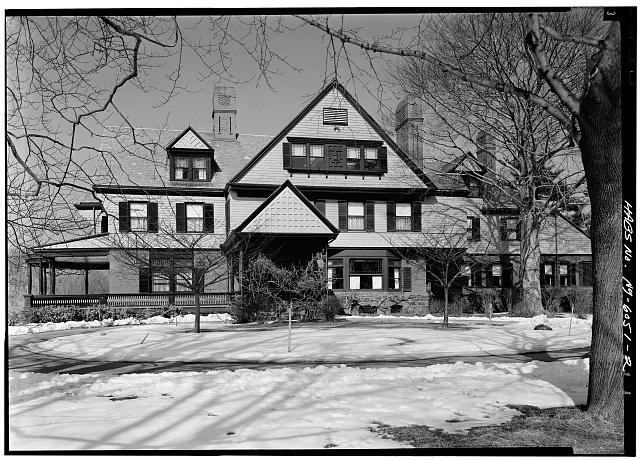 Although commissioned architects were responsible for the overall house plan design of Sagamore Hill, Roosevelt made sure that his ideas were incorporated in the home’s interior – from the woodwork to the architectural features. 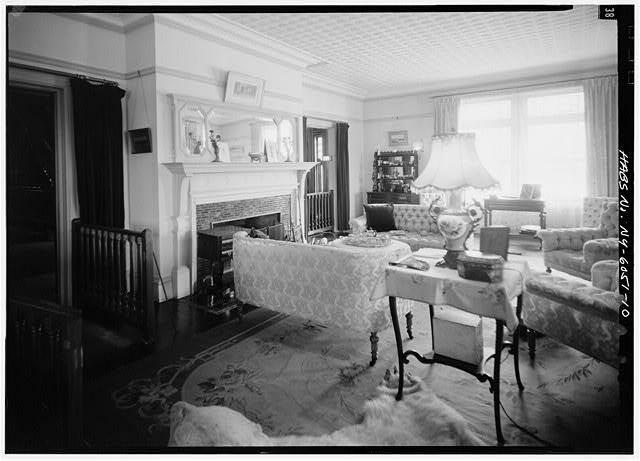 A large center hall is on the first floor, along with the library (which was Roosevelt’s private office), dining room, drawing room, and kitchen. 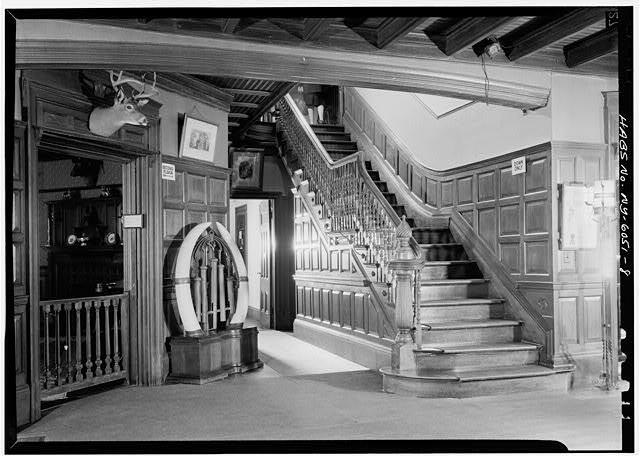 Two views of the Center Hall at Sagamore Hill: the top photo is from the fireplace end with one of Roosevelt’s hunting pieces mounted atop the mantel (Library of Congress, Prints & Photographs Division, HABS, Reproduction number HABS NY,30-OYSTB,2- Public Domain); the bottom photo shows the staircase to the second floor living space (Library of Congress, Prints & Photographs Division, HABS, Reproduction number HABS NY,30-OYSTB,2- Public Domain). On the second floor were the bedrooms, nursery, guest rooms, dressing room, gun room, servants’ quarters, and a bathroom with a large porcelain tub, which was a luxury item in the late 1800s–early 1900s. 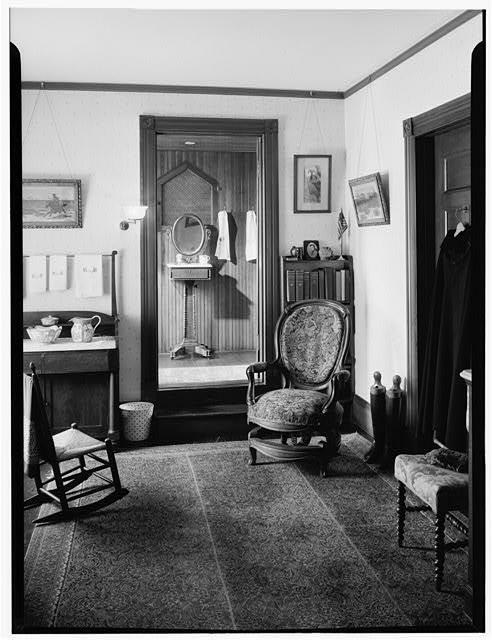 A rocking chair, a pair of upholstered ones, and a rug shown here are part of the second floor dressing room at Sagamore Hill (Library of Congress, Prints & Photographs Division, HABS, Reproduction number HABS NY,30-OYSTB,2- Public Domain). In 1880, the 22-year old Harvard graduate bought 155 acres of property on Cove Neck in Oyster Bay – which included woods, bay beach and a hill. Roosevelt intended to build a house on that hill for himself and his wife at the time Alice Hathaway Lee. 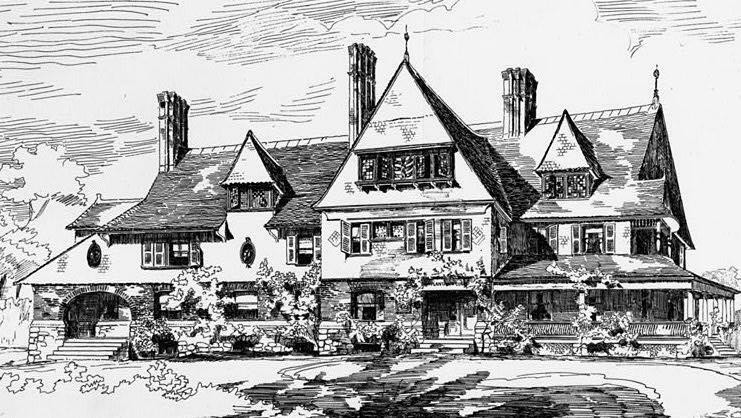 Perhaps influenced by the summer homes on the North Shore – and the prevailing Victorian style of houses of the era, Roosevelt commissioned New York architects Lamb & Rich to design a Shingle-style Queen Anne home plan. And while not an architect by avocation like George Washington, Thomas Jefferson, and Franklin Delano Roosevelt, this Roosevelt – the 26th President of the United States also known as TR – was involved in every detail of Sagamore Hill’s design and construction. This sketch of the north elevation of Sagamore Hill shows how it was envisioned by New York architects Lamb & Rich (Library of Congress, Prints & Photographs Division, HABS, Reproduction number HABS NY,30-OYSTB,2- Public Domain). An addition has since been added. In 1884, construction began on the home that Roosevelt originally planned to call “Leeholm” after his wife Alice. It included covered porches, verandas with views of Oyster Bay and the Sound, and expansive grounds where their children could engage in outdoor activities. When Alice died that same year after giving birth to their daughter (also named Alice), Roosevelt had to be convinced by his sister to finish construction to give the baby a home. By 1885, the home was completed – with his sister Anna and the baby living there while Roosevelt went out to his ranch in the Dakota Territory where he drove cattle and hunted big game. After a severe winter in the Dakotas, Roosevelt returned to New York. And during a trip to London in 1886, he married his second wife - childhood friend Edith Carow. In 1887, they moved permanently to Sagamore Hill, where they raised Alice and five of their own children. It was during this time that Roosevelt named their home Sagamore Hill in honor of an Indian sagamore (the Algonquin word for chief) who once lived in the area. 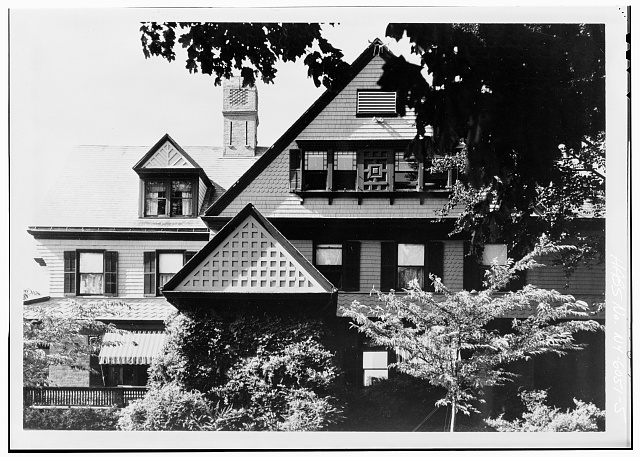 At top is a view of Sagamore Hill from the south end (Library of Congress, Prints & Photographs Division, HABS, Reproduction number HABS NY,30-OYSTB,2- Public Domain). 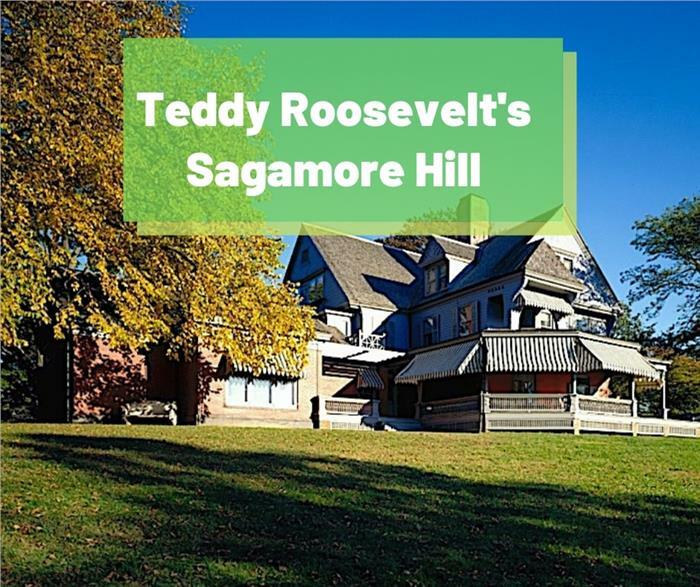 The Sagamore Hill property attracted Roosevelt because of its woods, trees, and grounds, where he and his family could be close to nature and participate in outdoor activities. 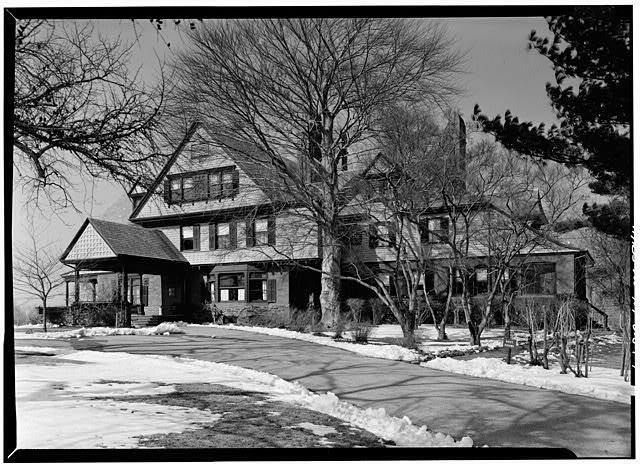 What sets Sagamore Hill apart from other historic homes is that it stayed in the Roosevelt family from 1885 to the 1950s, when it was turned over to the Theodore Roosevelt Association. For this reason, the home and its contents have remained mostly intact – including original furnishings, Roosevelt’s books and other prized possessions. In 2011, the Sagamore Hill National Historic Site took on a massive $10 million project of restoring the home and preserving it for decades to come. 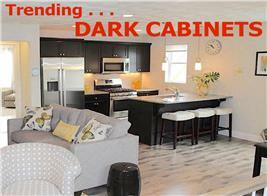 The interior was refurbished and the exterior reinforced. The roof, gutters, and woodwork were repaired; windows replaced; wallpaper re-applied; and electrical wiring, lighting, and security systems updated. Roosevelt’s animal head collection, paintings, artifacts, and books were repaired, cleaned, and placed where the President had originally positioned them. 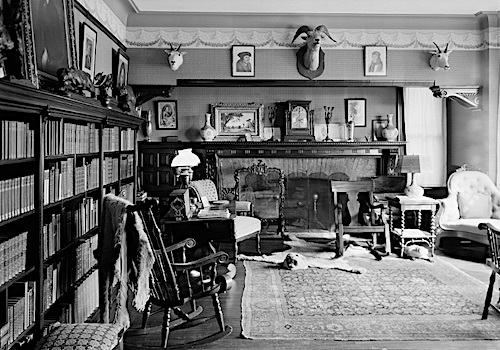 Teddy Roosevelt’s library has retained its original look – with his books, souvenirs, artifacts, and animal rugs remaining in the same spots. It’s the same with the North (Trophy) Room and the animal heads. 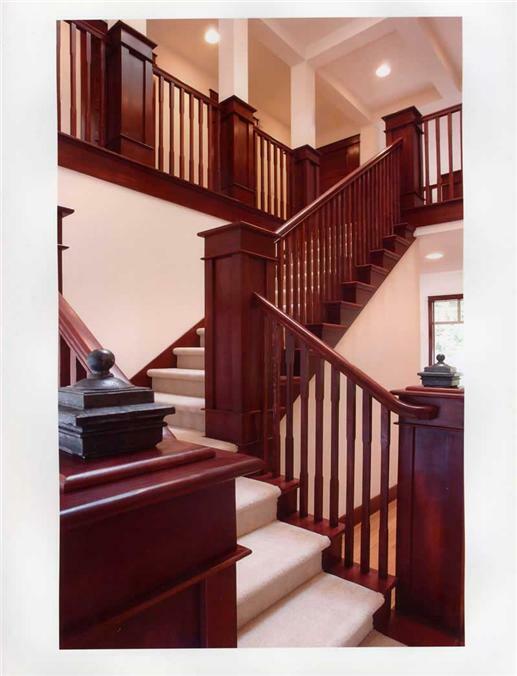 The simple but impressive woodwork on the walls, ceiling, and rail is influenced by the Craftsman and Arts and Crafts style. The Gun Room on the second floor – with his favorite desk – has also been refurbished to perfection. 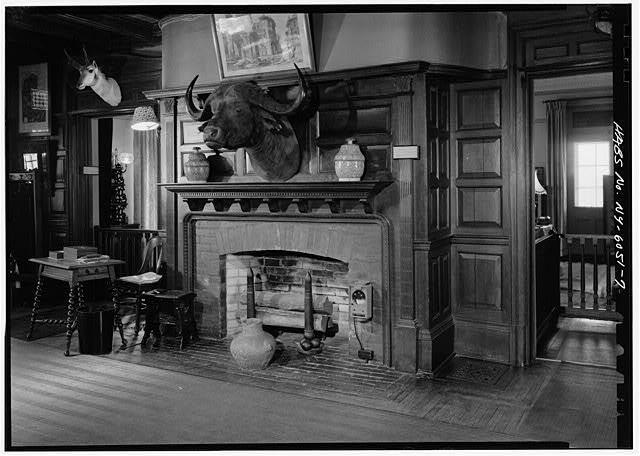 Inside the North-Trophy Room is the head of an elk shot by Roosevelt. On its antlers hang his “Rough Rider” hat … and on the wall is a simple TR monogram. And finally, after more than three years of being closed to the public, Sagamore Hill reopened its doors in the summer of 2015. The intricate woodwork finish on the stairs and railing in the center hall of Sagamore Hill is reminiscent of the Arts and Crafts style. The same simple but eye-catching workmanship is seen in the staircase of this 2-story, 3-bedroom Arts and Crafts home (Plan #115-1000). So we celebrate Teddy Roosevelt, one of America’s greatest Presidents, and his contribution to modern home design epitomized in Sagamore Hill, his Long Island estate.